Arrival of the bodies of the three aid workers killed in the 1 March attack in Rann, north-east Nigeria. Maiduguri airport, Borno State. 2 March 2018. The aid worker, Hauwa Mohammed Liman, a 24-year-old midwife and nurse had been working in the town of Rann, near the border with Cameroon. She was abducted on 1 March, along with two other nurses, Saifura Hussaini Ahmed Khorsa and Alice Loksha, following an attack on the town by armed extremists, in which dozens were killed. The Secretary-General expressed his deepest condolences to the family, friends and colleagues of Ms. Liman and his solidarity with ICRC staff. “Those responsible for this killing must be brought to justice,” he stated. 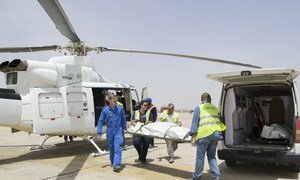 Among the casualties of the 1 March attack in Rann, were three UN aid workers: Emmanuel Yawe Sonter and Ibrahim Lawan who worked with the International Organization for Migration (IOM) and Dr. Izuogu Onyedikachi who worked with the UN Children’s Fund (UNICEF). Saifura Hussaini Ahmed Khorsa, one of the other two abducted nurses, who also worked with ICRC, was killed a month ago after spending six and a half months in captivity, in what the UN Humanitarian Coordinator for Nigeria called a “cowardly, heinous and despicable act”. According to news reports, Alice Loksha, who worked with UNICEF in Rann, remains in the hands of the armed group who seems to have announced its intention to keep her “as a slave”. Expressing “concern for the safety and well-being of the remaining hostages”, Mr. Guterres called “for their immediate release” and emphasized that “all parties to the conflict must protect aid workers who provide life-saving humanitarian assistance to the millions of people in need in north-east Nigeria”. 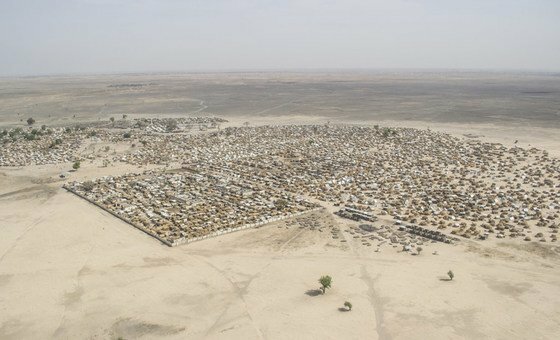 According to the UN humanitarian affairs office (OCHA) the international response in Rann is providing life-saving assistance – including food, safe water, shelter and medical care – to over 60,000 internally displaced persons, and millions in the rest of the north-east of the country. 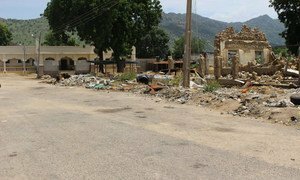 Close to 3,000 aid workers are present in the north-east, the majority of whom are Nigerian nationals. The humanitarian crisis in Nigeria's north-east is one of the most severe in the world today, with 7.7 million people in need of humanitarian assistance, 6.1 million of whom targeted for humanitarian assistance in 2018. The UN Resident and Humanitarian Coordinator in Nigeria, Edward Kallon, condemned on Monday the killing of an aid worker who had been held captive by a non-state armed group in north-east Nigeria since March.